Introduction: This paper aims to determine the diagnostic accuracy of initial clinical assessment in the diagnosis of acute diverticulitis (AD). Patients and methods: Retrospective analysis. Patients admitted to the surgical unit via A&E between Apr 2002 and March 2006 inc. (4y) were identified using the International Code of Diseases (ICD-10 version 2007) coding system. Exclusions were gynae, medical or those discharged at the A&E level. Code K00-K93 was used to segregate GI emergency. Code R10 was used to identify ‘abdominal pain’. Code K57 was used to identify admissions with acute diverticulitis (AD) of the GI tract. From this list, case notes were appraised. 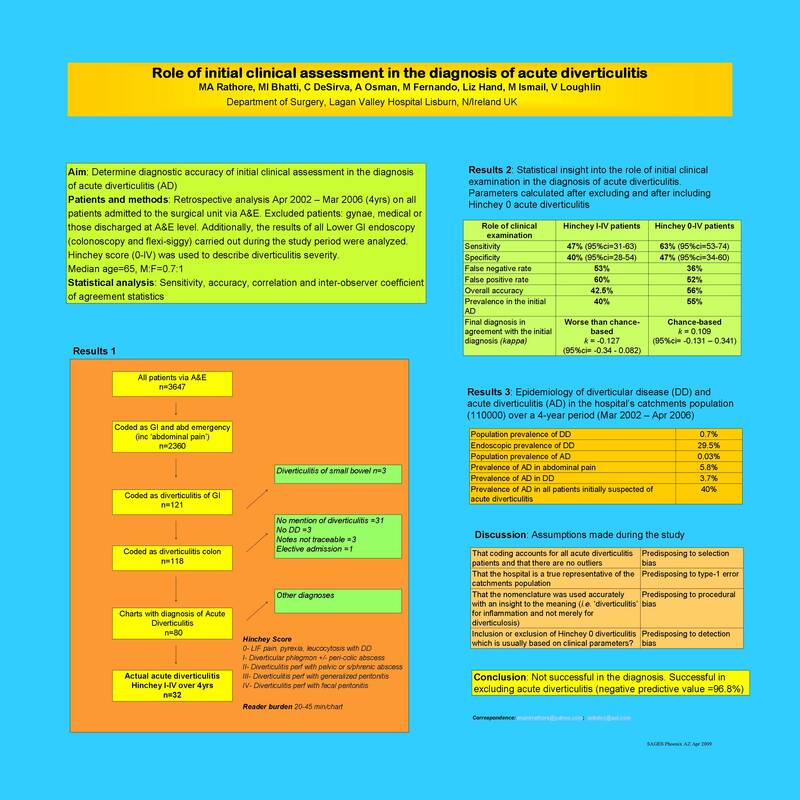 Modified Hinchey score (0-IV) was used to describe diverticulitis severity. Results: Between Apr 02 and mar 06 (4y), n=3647 presented to the surgical take (75/month). These form 3.3% of the hospital catchments population (110000). The patients with GI emergency including acute abdomen were n=2360 (64.7% of all referrals and 2.1% of population). Patients with acute diverticulitis of the GI tract were 121. Three were excluded (small bowel diverticulitis). From the remaining n=118 notes there were more exclusions: no mention of diverticulitis (n=31), no diverticular disease (n=3), notes not traceable (n=3), elective admission (n=1). Hence there were 80 eligible patients. Confirmed AD was seen in 32/80 patients. The median age=65y (mean=65 mode=43 iqr=51-77 range=32-89). M:F=0.7:1. The diagnostic capability of initial clinical assessment revealed a sensitivity=47%, specificity=96.8%, false –ve rate=53%, false +ve=60%, an AD prevalence of 40% from the initial AD-coded patients and an overall accuracy of 42.5%. The initial diagnosis agreed with the final only on the basis of chance (k= -0.127 SE=0.1 95ci -0.34 – 0.082). The population prevalence of diverticular disease (DD) =0.7%, endoscopic prevalence of DD=29.5%. The population prevalence of acute diverticulitis was 0.03% of the population, 1% of all GI+abdominal emergency, 5.8% of all emergency abdominal pains alone, and 3.7% of all DD. A strong correlation of acute diverticulitis was seen with CRP (r=0.5) and WCC (r=0.3).